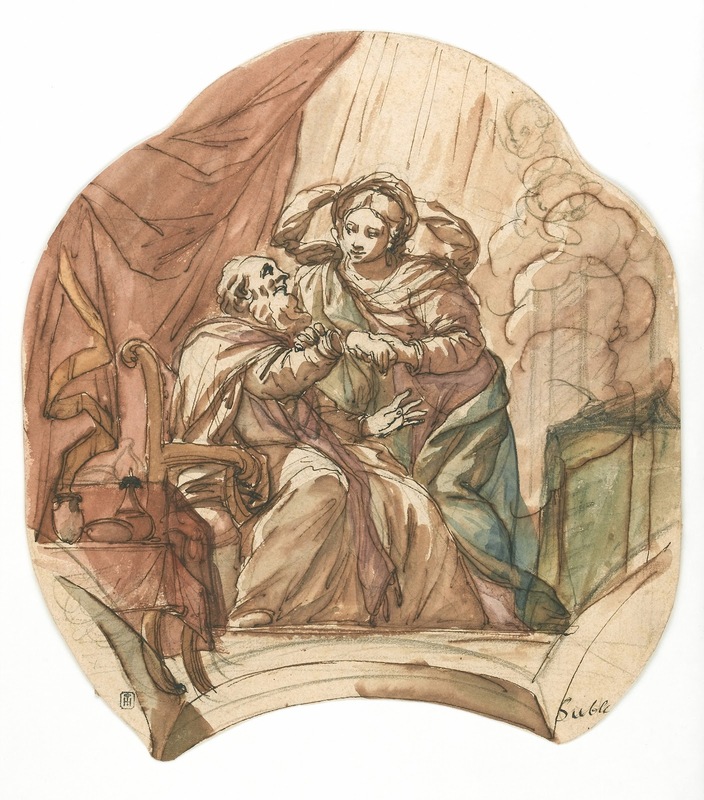 Mezzotint by Jacob Gole (1660?-1737?) after Annibale Carracci. It is a common experience to have enough feet but not enough shoes. 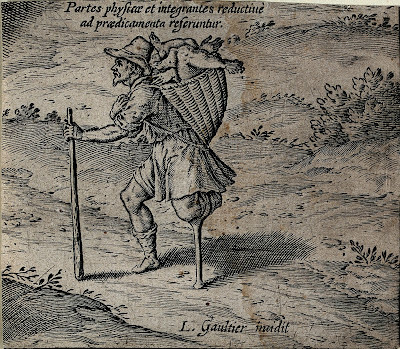 The man shown here is, paradoxically, in the opposite situation: he has plenty of shoes but lacks a foot. The irony has a further twist: he is a shoe-seller whose single surviving foot is unshod, presumably because he cannot afford his own wares. 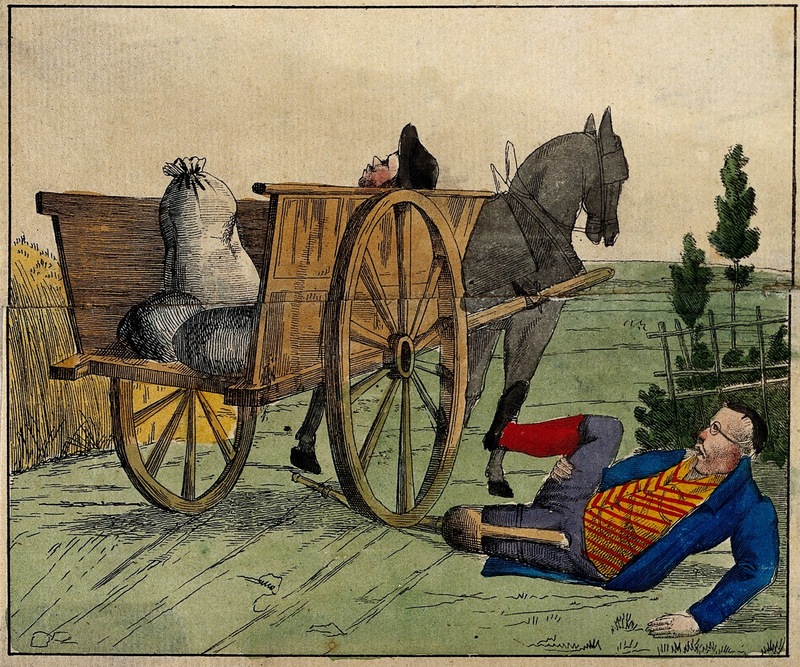 No wonder he needs to keep up his spirits with a tobacco pipe.Black humour (gallows humour, Galgenhumor) is a common feature of discourse about disability. However much we may deplore the fact, loss of mobility due to amputation of the lower limb – at the thigh, leg or foot – has been considered a particularly appropriate subject for such humour, perhaps owing to suppressed fear of losing such mobility as we may have. 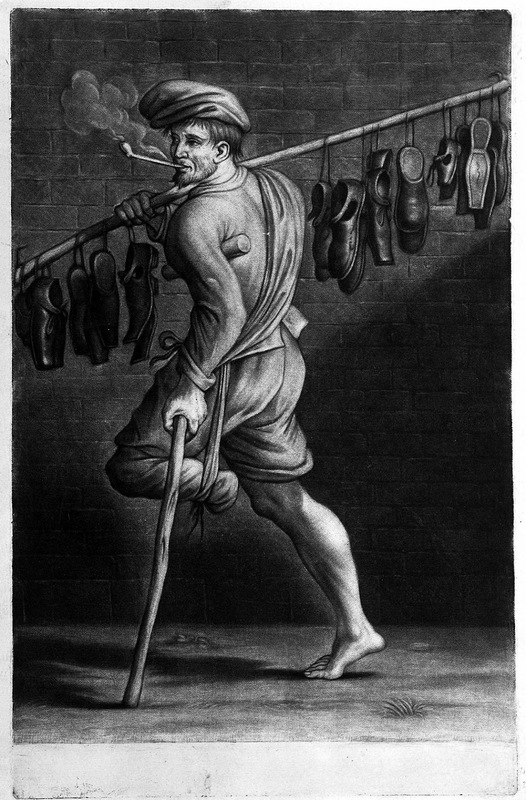 Irony is a way of playing down the horror of immobility while at the same time acknowledging it; and there can be intellectual pleasure (at least for functional bipeds) in the various paradoxes that can arise from limblessness, which are prominent in the drawings, photographs, prints and paintings in the Wellcome Library shown here. 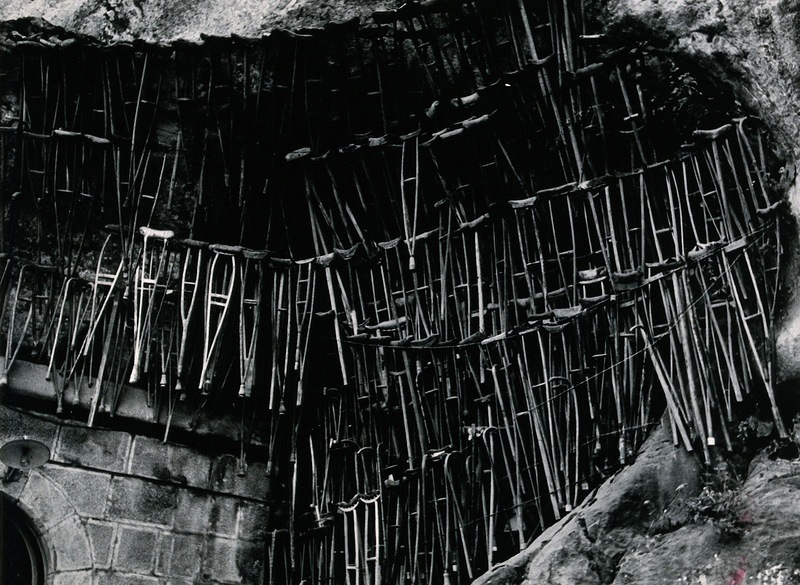 Loss of a limb in a railway accident elicits no sympathy from this compensation board. 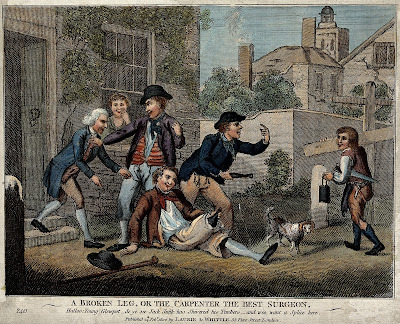 The victim (to Chairman) “Sir, in consequence of the carelessness of your servants. I have been compelled to have my leg amputated, besides suffering other injuries, and I consider myself entitled to compensation.” Facetious director. “Lost your leg have yer? Regular stumps etc? – Well! If yer any-think of a cricketer it must be an ill-convenience!” Benevolent chairman. “Quite right sir – qu-i-te right, compensation by all means, loss of leg – eh? 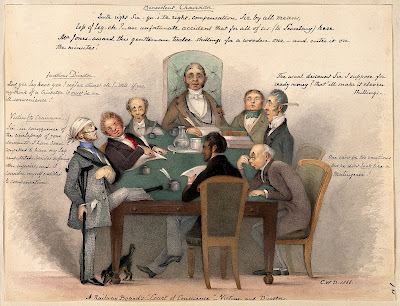 – an unfortunate accident that for all of us.” (To secretary) “Here Mr Jones award this gentleman twelve shillings for a wooden one – and enter it on the minutes.”‘ Jones replies: “The usual discount sir I suppose for ready money? That’ll make it eleven shillings.” Another director adds: “One can’t be too cautious but he don’t look like a malingerer!”. To break one’s natural leg is bad enough, but then to break its wooden replacement adds insult to injury. Two approximately contemporary prints show this subject. 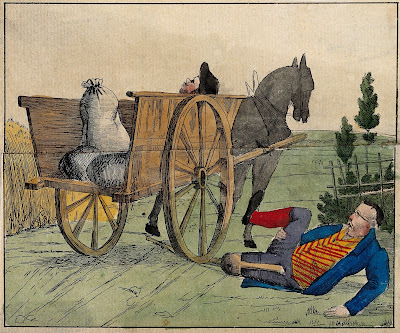 In the one above, the driver of the offending vehicle is asleep at the reins. But at least here the victim can smile as he sees the irony of his situation – and it’s much less painful this time round for the young sailor who had lost his leg in the Far East. 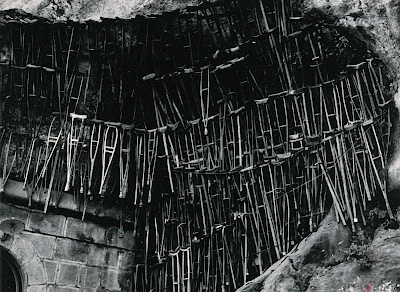 Fortunately a carpenter is passing with a saw and pot of glue in hand; “A broken leg, or the carpenter is the best surgeon. Haloo! 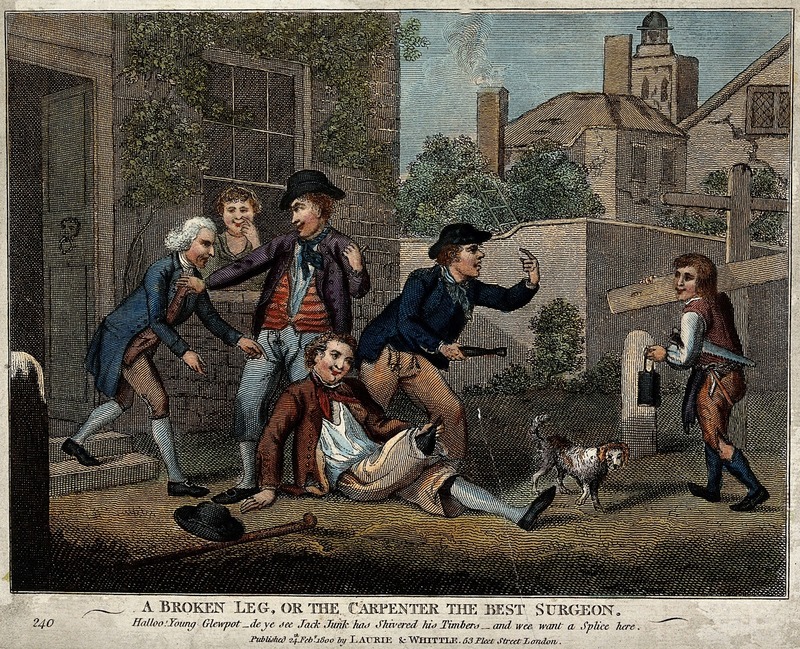 Young Glewpot, de ye see Jack Junk has shivered his timbers, and we want a splice here.” The surgeon coming out of his house on the left has no part to play on this occasion, and is pushed away. “What, no legs? 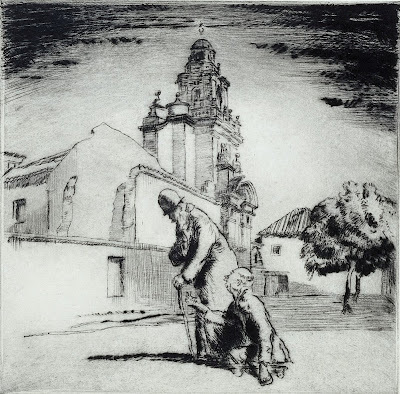 Lucky man!” are the words spoken by Ahasuerus (the Wandering Jew) to an immobile Spanish beggar in Frederick Carter’s gloomy etching. It is the Jew’s misfortune to be forever moving over the face of the earth without respite; the beggar’s not to be able to move at all. You can see the world, or you can have a rest, but you can’t do both. Coloured lithograph by C.J. Grant, 1834. Wellcome Library no. 11854i. 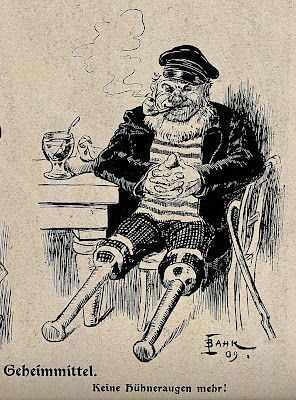 The regrowth of a natural leg from an amputation stump was considered absurd enough to be worthy of an advertisement for Morison’s pills – the heavily-advertised vegetable remedy for diseases attributed to iatrogenic blood poisoning. 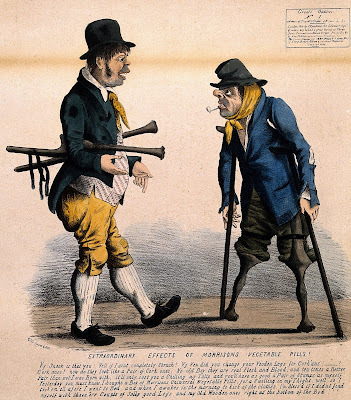 The man on the left went to bed with wooden legs, took a dose of Morison’s Universal Pills, and “when I awakes in the morning to kick off the clothes, I’m blessed if I didn’t find myself with these ‘ere couple of jolly good legs and my old wooden ones right at the bottom of the bed!! !”.Yet … looking towards a future age of stem-cell therapy, who would claim that regeneration of a limb could not occur? Colour lithograph by H.G. Banks, ca. 1899. It would need more than stem-cell therapy to put poor Callaghan together again. In the song What will poor Callaghan do? 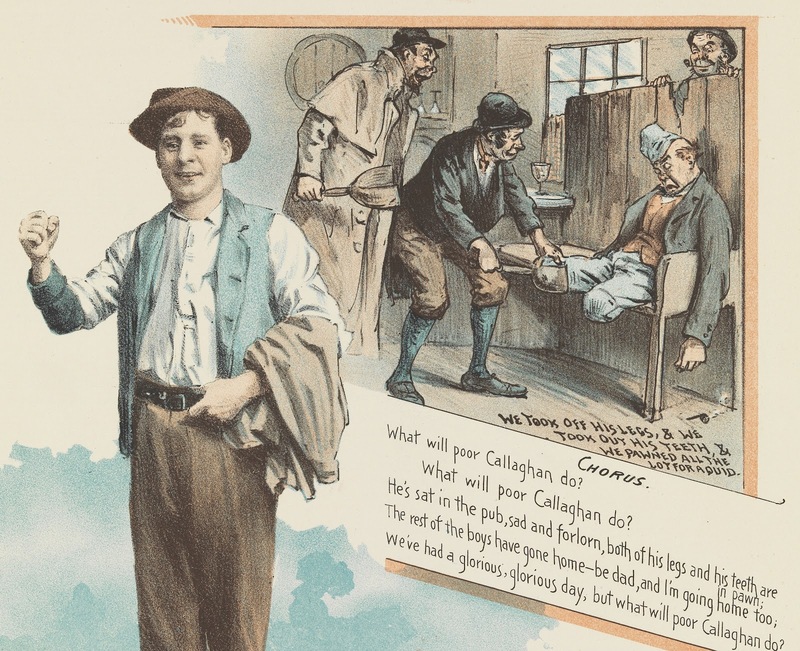 a disabled soldier has his wooden legs stolen by four drinking companions in a bar.The song describes an evening out for four stage-Irishmen called Hogan, Casey, Murphy and “me”; originally “me” was Michael Nolan, a popular Irish music-hall performer. They had spent all their money drinking beer in a pub with an ex-Highland soldier called Patsy Callaghan, who had had his legs shot off from under his kilt when at war. To recover their funds, they got Callagahan drunk, removed his wooden legs and false teeth, pawned them, and left Callaghan literally legless on the pub bench. 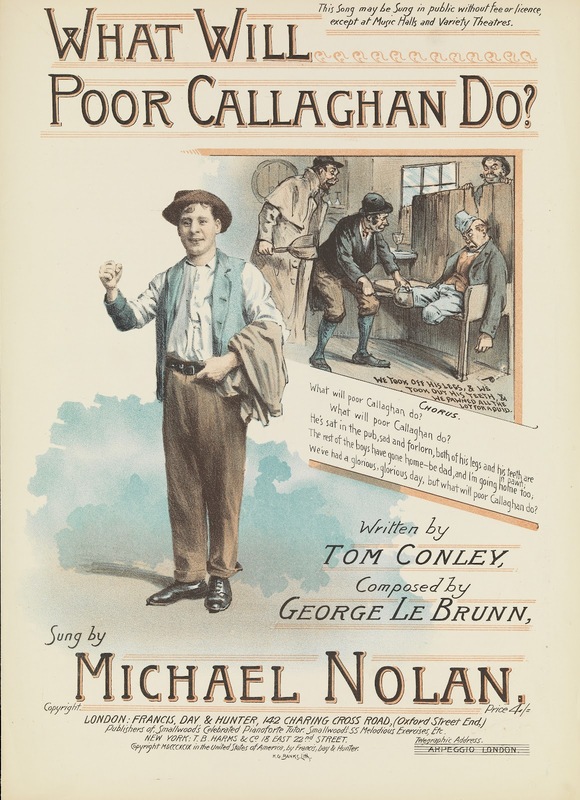 His plight, depicted on the front cover of the songsheet, is regarded by all as hilarious, though the speaker can’t help wondering (in the words of the chorus) “What will poor Callaghan do?”. Poor Callaghan was a precursor (or, from another point of view, a post-mediaeval successor) to The Black Knight in Monty Python and the Holy Grail (1975) who unwillingly makes comedy out of limb-deprivation. “‘Tis but a scratch!” he says after losing one arm, “It’s just a flesh-wound!” after losing the other, and “All right, we’ll call it a draw” after finally losing both legs. Before the Black Knight, one-leggedness had been the subject of another piece of tasteless comedy: One leg too few, a sketch written by Peter Cook while a Cambridge undergraduate in 1960. 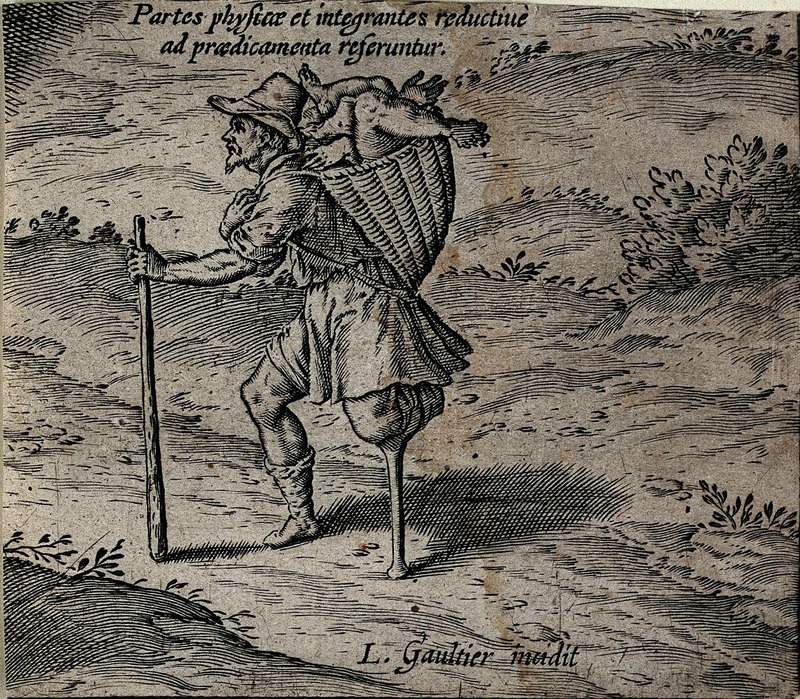 For this sketch Cook appears to have coined the Latin-derived word “unidexter” to denote a person with one leg, although there was already a Greek-derived word in English, namely “monopod”. Again there was an ironic twist of which some audiences were unaware: the actor playing the one-legged role (Dudley Moore) had had club-feet as a child and still had one ineffective leg. Irony and club-foot lead us on the well-intentioned but disastrous operation in Flaubert’s Madame Bovary (1856), but we have enough space here merely to allude to it. 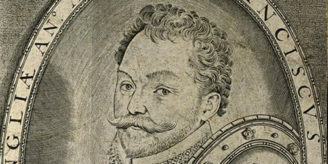 Oil painting attributed to the Master of Los Balbases, Burgos, ca. 1495. Conversely, many people are shocked by the absence of irony in this Spanish altarpiece showing a verger’s dream. 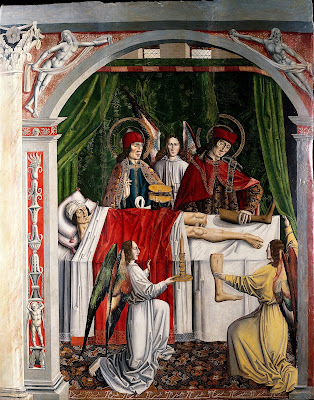 The verger dreams that his bad leg is substituted by Saint Cosmas and Saint Damian with the leg of a black man, and on waking, finds it is true. Some viewers tend to resort to jocularity, showing that they are sophisticated enough to realize that transplants cannot routinely be performed by such means, but not knowledgeable enough to understand the episode as a miracle that could, for example, comfort diabetics. The dream of Saint John Damascene: the Virgin attaches his severed right hand. 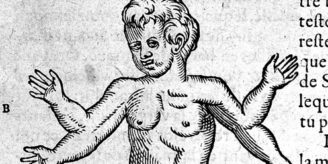 Similar pictures showing the reattachment of a hand do not seem to arouse the same facetiousness. But then in favourable circumstances, surgical reattachment of a hand (or for that matter a foot) to its original limb is not impossible today, according to this popular webpage about “fascinating reattachment surgeries”. That really is something to be glad about.The first examples discussed here have irony and humour, while the last two examples show that in religious contexts lack of a limb could be represented without humour and without irony. Let’s end with an example that has irony but not (I suggest) humour. Was it Jasper Carrott who came up with the immortal line: If you break your leg, don't come running to me for sympathy? – or does that line run back into antiquity? James, Thanks for the quote: eminently ironic, whoever first thought of it.